Having a problem with your data connection or having a hard time to connect even though you have a strong signal and enough load to use mobile internet service? Better check your APN or Access Point Name Settings first if they are configured properly, to enjoy high speed mobile internet experience and access. For Globe Telecom and Touch Mobile Subscribers. Most of their subscribers are using the old default apn - myGlobe Connect with www.globe com.ph,which is super slow. I highly recommend to use this apn: http.globe.com.ph or the so called myGlobe INET settings. For Smart Communication Inc. and Talk n' Text Subscribers, try to use: smartbro, internet or smart1. But i prefer you to use the first one. For ABS-CBN Mobile users, just use: internet.abs-cbn.com.ph as your apn. Note: For Smart Communication's subscribers, activate your SIM Card first by texting GPRS ON or 3G ON and send to 3333. For Sun Cellular Subscribers, just text GPRS and send to 2300. This isn't applicable to me because I don't avail of the services, but very helpful for those who need it! I'm saying thanks for all of 'em. Great information that anyone can use! It is always good to have reliable internet! This is really helpful. I wish I knew this before. I'm using postpaid plan now but I will share this to my friends who are currently in prepaid plan. Thanks for the info! I've been having slow connections too. Will see how this can help me. Wow thanks for the info! The internet here in the PH can really make users frustrated. This is very helpful! I always have this problem and it's hard to look for this in google. Thanks for this post! So far I don't have any problem ith my APN, I think. I have good connection naman so I guess everything's pretty alright. this is a very useful post! I always have issues with my ISP either on our connection at home or using the mobile data! Hopefully, this could fix the issue! For my Globe, I already tried all available apn's before, the reception is just really weak where I live now. In our old apartment, I can go up to 3mbps download speed. Now I just find it hard to even connect. Anyway thanks for this useful post. 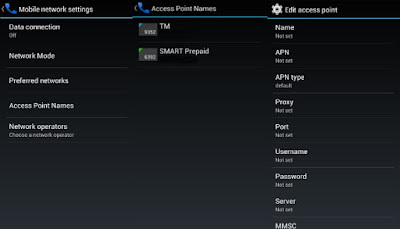 I never thought there are different APN settings for each telco. Now I got curious, will be checking my APN settings, haha!